Great news! By popular demand, we are adding paid features to our platform! 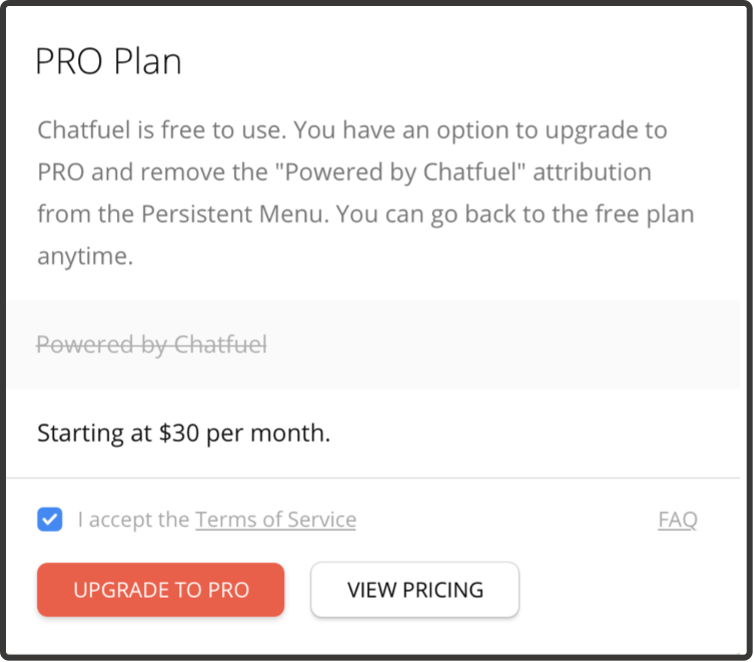 Chatfuel’s new PRO Plan will enable users to remove the “Powered by Chatfuel” attribution for a fee. To be clear — Chatfuel remains a free platform, with no limitations introduced to the free plan. But we want to give our users the ability to access new features that are most important to them. As the first step, we will soon be releasing the option to remove the “Powered by Chatfuel” attribution from the bot’s Persistent Menu for a fee. Chatfuel’s PRO Plan will appear as a paid add-on in the dashboard within a month. At that time, bot admins will be able to remove the attribution for a monthly fee based on the number of bot’s reachable users. Option to remove the “Powered by Chatfuel” attribution is the only paid feature being released at this time. The fee will be based on the reachable bot users and will start at $30 per bot. On the free plan, the “Powered by Chatfuel” attribution will remain on the first menu level without the ability to be moved to the second level. No other changes or functionality restrictions will be applied to the free plan. Additional paid features and functionalities will be rolled out in due course.